This past week, the calendar officially transitioned from summer to fall, so I thought I would do one last summer fun filled post before moving on to warm sweaters and falling leaves. Lately, I am craving all things associated with home – my mom’s berry pie, our backyard picnic table complete with red check tablecloth and mason jar beverages, as well as being surrounded by family and friends. 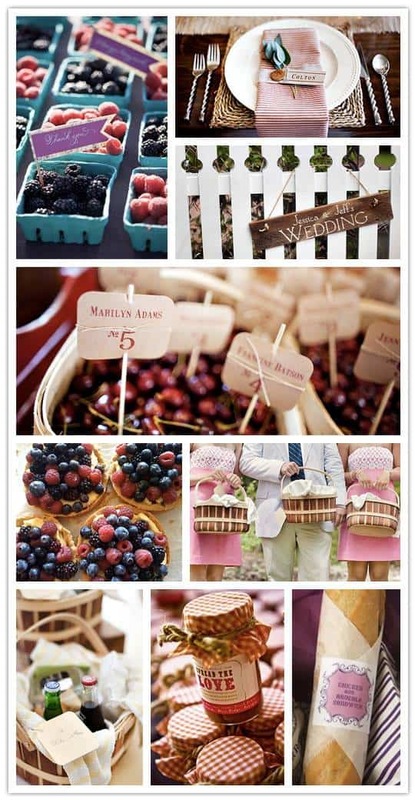 This led me to dream of a picnic wedding in bright summer berry red and blues. Details of sweet cherries, picnic baskets and home made jam favors had me wanting to plop down on a quilt covered wooden bench and toast the bride and groom with and fancy cocktail of strawberry lemonade. I’m loving hand made details like the button place cards, jute place mat and the lovingly crafted box lunch. The painted wooden sign is another favorite item. Of course, a picnic wedding wouldn’t be complete without some yummy wedding pie! Loving you inspiration boards – this might make this week’s favorites!